Indian manufacturer Karbonn Mobiles has come up with HD version of its Android tablets TA-FONE A34 and TA-FONE A37. 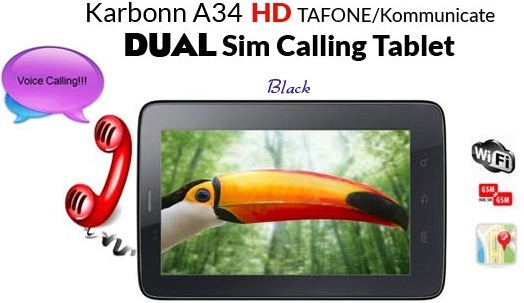 As of now, we are yet to hear anything about the launch of Karbonn TA-FONE A34 HD Kommunicate and Karbonn TA-FONE A34 HD Kommunicate, however naaptol.com has now listed them with all the specifications and pricing details. All the specifications of the Karbonn TA-FONE A34 HD Kommunicate and Karbonn TA-FONE A34 HD Kommunicate are similar to Karbonn TA-FONE A34 and Karbonn TA-FONE A37 respectively, the only difference is that the newer version offers a higher resolution display. 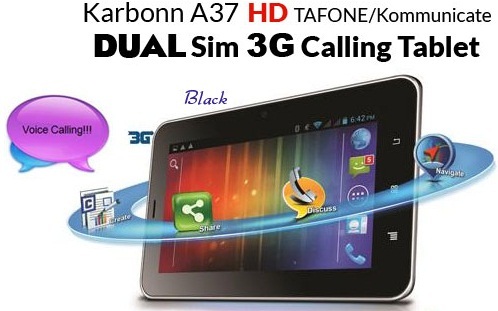 Karbonn TA-FONE A34 HD Kommunicate is priced at Rs. 7290 and the Karbonn TA-FONE A37 HD Kommunicate is priced at Rs. 9490. We are expecting a price cut for the Karbonn TA-FONE A34 and Karbonn TA-FONE A37 soon as the price difference between the HD version and non-HD version of these tablets isn’t that huge which makes the HD versions an obvious choice for the buyers.